Increase Mac speed by optimizing Mac: How to repair Mac with Disk Utility? Enhance Mac performance with simple Mac optimization tips and tools. Keep your Mac running smooth and secure with easy to use applications. 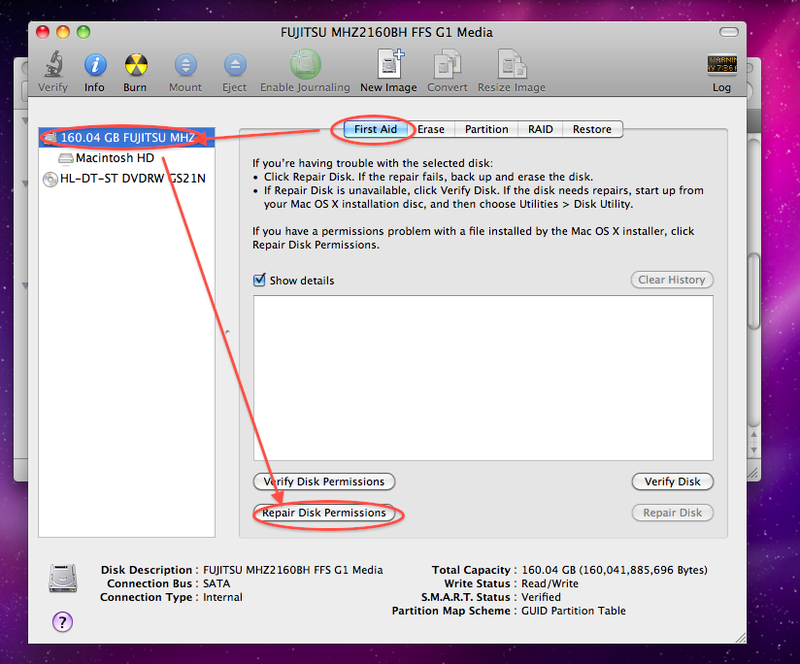 How to repair Mac with Disk Utility? Disk Utility is included with OS X and can be used to repair system file permissions and minor errors in a Mac disk's directory structure. You can find it from Utilities folder within the Applications folder on the hard drive. You can use Disk Utility not only to erase, format, and partition a drive, but also to repair problems that may crop up from time to time. Disk Utility can repair common disk issue. Disk Utility’s Repair Disk feature is excellent at making minor disk repairs to a hard drive’s file system, and it can make most repairs to a hard drive’s directory structure, but it’s no substitute for a good backup strategy. Disk Utility’s Repair Disk Permissions feature is designed to restore file or folder permissions to the state the OS and applications expect them to be in. Permissions are set for each item in the file system. They define whether an item can be read, written to, or executed. After a power outage, hard restart, or system crash —especially if your Mac behaves anomalously thereafter. Periodically, as part of your regular maintenance routine, to identify any hidden directory corruption before it becomes a problem. See our Maintaining Mac OS X FAQ for our recommended regular-maintenance routine. Before installing software, particularly Mac OS X Updates: see our "Installing software updates". Before reinstalling Mac OS X. In general, given the choice between the Verify or Repair buttons in Disk Utility, select Repair to save time. Verify only checks for problems. If problems are found, you then need to run the corresponding Repair. Repair both verifies and, if problems are found, attempts to perform the required repair. We do not accept comments containing with links. How to check Mac Drive Performance? How to delete Internet temporary files in Mac? Are the deleted files really get deleted? Defrag your Mac- Is it good? Can Onyx optimize my Mac properly?